Arieleha - Our first grey! Arieleha (pronounced Air-rah-lay-ah) was our very first grey. 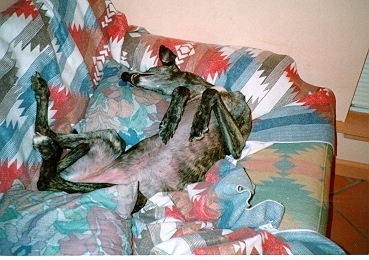 She was adopted out of Companion Greyhounds in Marietta, GA at age 4. She is now 10 yrs old and is a dark red brindle. She raced out of Florida, and retired as a Class A! Mom and Dad are very proud :-) Her racing name was CR's Arvie Leah. Seems the family that previously owned/raced her named all their dogs after family members. She is named after the owners Aunt. She's been with us for 6 years and is our sweet princess. Her hobbies include: sleeping, preferably on our waterbed or couch; cuddling with TC, the cat, playing Mother to our 7 week old kitten, Jypsum and trying to flip Mom or Dad's arm up in the air while they try to type on the computer! As you can see from the above picture, she is very happy with her retirement. The picture below is Air in one of her many favorite sleeping positions...such a lady! And You're Out of the Box!